I love how technology has made things more convenient for everyone. Am I right? Or am I right? For people like me who seldom have time to go to the mall to shop, online shopping has become a nice past time and semi addiction. From clothes, shoes, accessories, even appliances & furniture-- they could all now be sourced online. And it just got better! 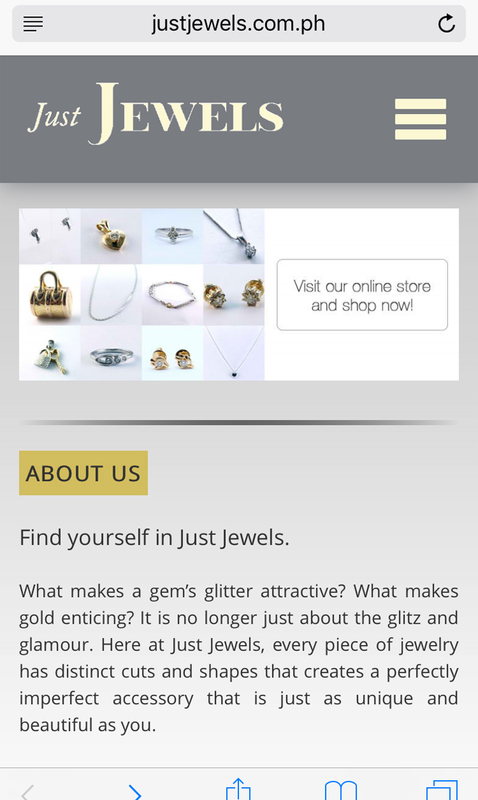 Now, you could also shop for fine jewelries with just a few clicks! 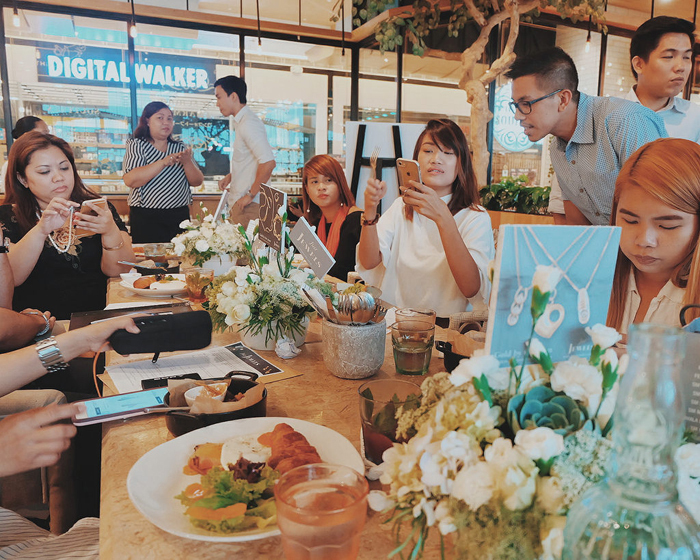 Just Jewels, the forerunner of by the gram concept in jewelry selling in the Philippines, has just launched their online store and it's every girl's dream. Scroll down below to see photos from the launch and their new online store! From precious diamonds to fine gold, Just Jewels provides sophisticated and contemporary women with a wide selection of quality jewelry. It boasts of more than 1,000 unique designs crafted to capture the essence of beauty and elegance of individuals from different walks of life. 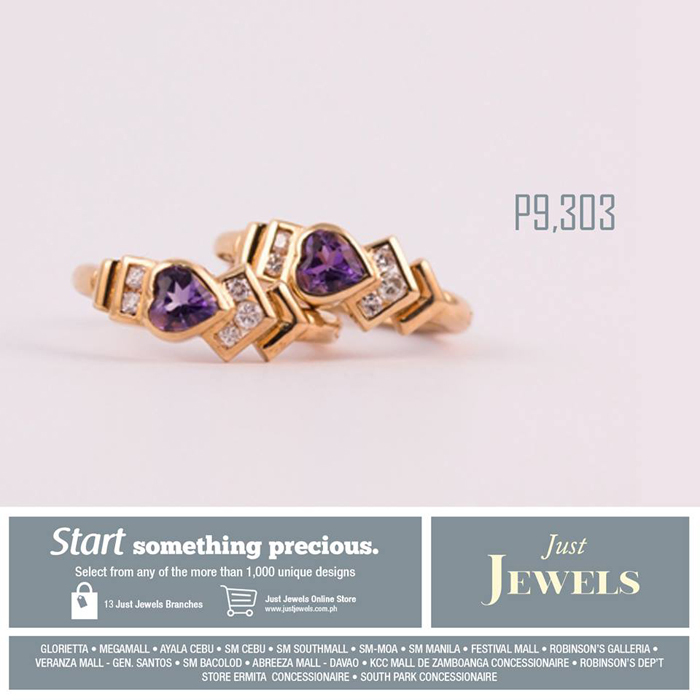 The Just Jewels online shop (www.justjewels.com.ph/store) is a virtual Just Jewels store where clients can easily shop anytime, anywhere. If you're feeling sad, bored or you just want to make a good investment, then just click away and choose from the thousands of jewelry they are selling online! How do I shop for Just Jewels items online? Simply create an account online and you should be able to use the online shopping facility immediately. Is it safe to mail the jewelry? Is shipping free? Yes, it’s perfectly safe to have your jewelry items delivered to your doorstep. Just Jewels have partnered with a trusted courier company (Xend) equipped with safety protocols to ensure timely and secure deliveries. They will be asking for a minimal shipping and handling fee of PhP221.00. How can I estimate the size of the jewelry to make sure it will fit me? Descriptions are provided for each item. I was looking for a ring that would fit me and I found a few which fits my tiny finger! Hihi. International shipping is not yet available. You can subscribe to their newsletter for updates! Yes, the products are fully insured by their courier partner so you need not worry! How long does it take to get my order? How do I track my order once it has been shipped? It takes around 5-7 days for to process, package, and deliver the item to you. Once shipped, you can input your tracking number into their courier partner’s online tracking facility to see the current status of your transaction. They accept Visa and Master Card credit Cards credit card payments. I asked if they accept debit cards and they said not yet but they are working on it! Delicious food from Le Petite Souffle! Photo grabbed from Ruth's blog! 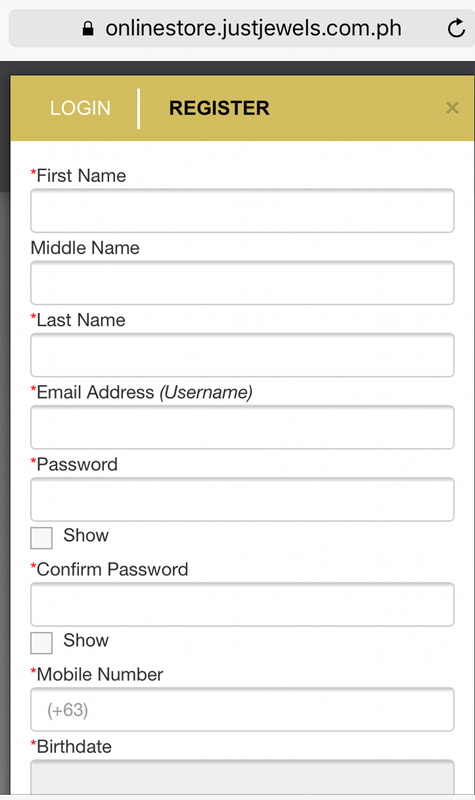 That's me trying to register online. Hihi. Tried browsing through their online store and it's super easy to navigate! Browse through their many selections! Choose your preferred category. In my case, RINGS! Wanted a ring which I can use everyday! Yung mukhang engaged but in reality I'm just engaged to myself because I love myself too much and I'm a strong independent woman. Haha! 1. It's a wearable investment. 2. You could pass it on as heirloom. 3. Its value does not depreciate unlike cars or bags. 4. It does not break or get damaged. 5. It could last a lifetime! 6. It is a fashion statement. 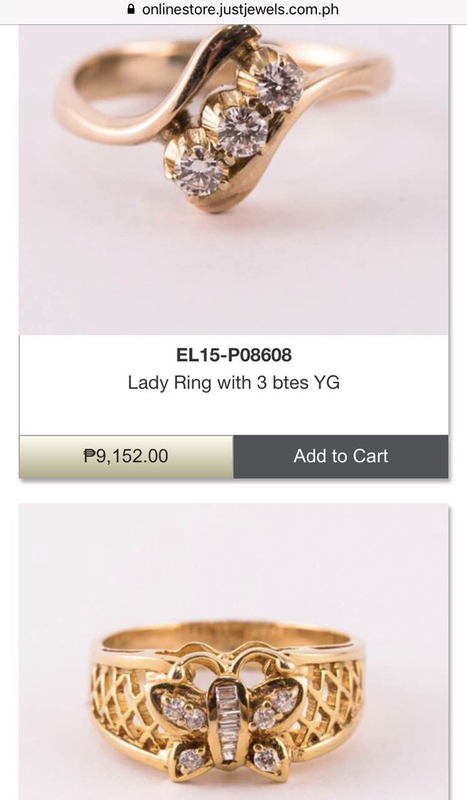 Yesterday, I dropped by their Megamall branch to physically check what rings they have. Of course, I looked for something pretty and affordable! Their sales staff were all super nice and accommodating. They were very patient and they helped me find the perfect ring. We even shared travel tips and stories! Hihi. Just Jewels also offers different plans according to your needs, budget or preference. 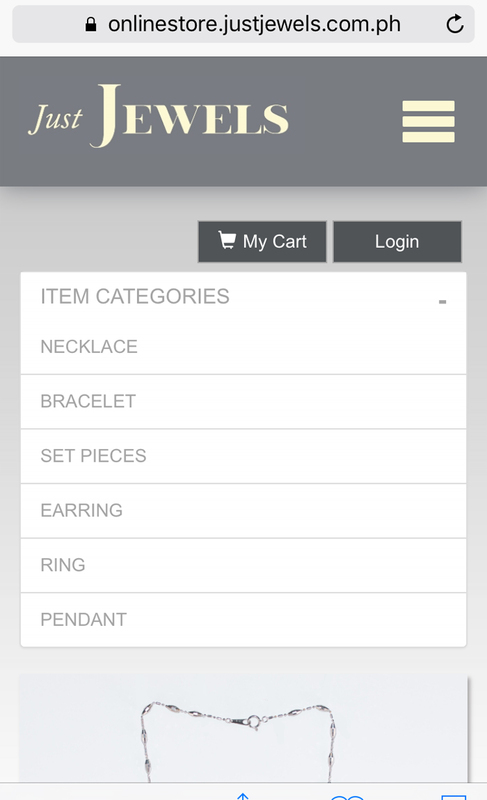 See below their available plans for all you jewelry lovers! 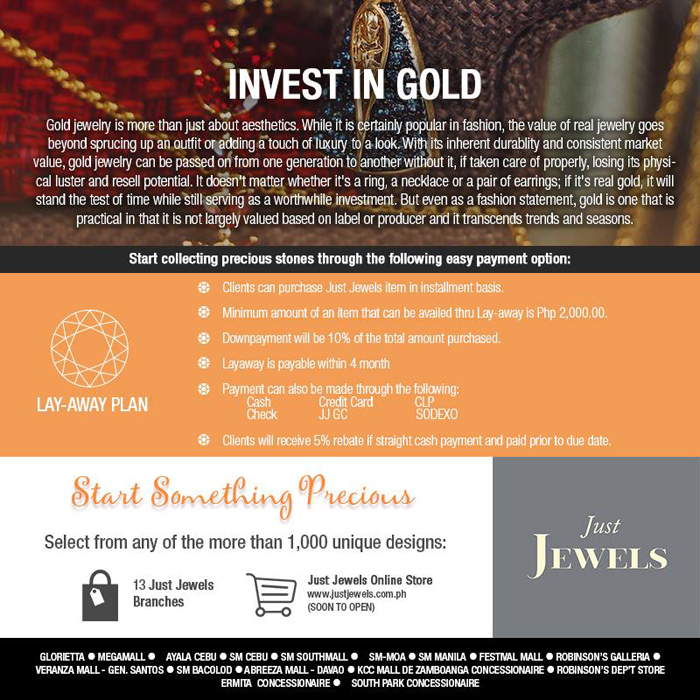 Lay-away is a Just Jewels program that allows client to pay for their chosen jewelry piece in installment basis payable within four (4) months. Clients will get their jewelry upon full payment without interest. The client is required to pay a down payment of 10% of the total amount purchased and will receive a 5% rebate if the item is paid in straight cash payment and prior to due date. The minimum amount of an item that can be availed thru lay-away is Php2,000. I love its simplicity and how it's not super gold. It will go well with any outfit db? They allow their client to pay for their chosen jewelry piece in installment basis. Clients will get their jewelry upon approval of their application and background investigation with 3.5% interest. The loan term is minimum of six (6) months up to 12 months from the date granted. Clients need to pay a down payment of 20% of the amount purchased. Late payment fees of 10% per month of total amortization will also be collected. 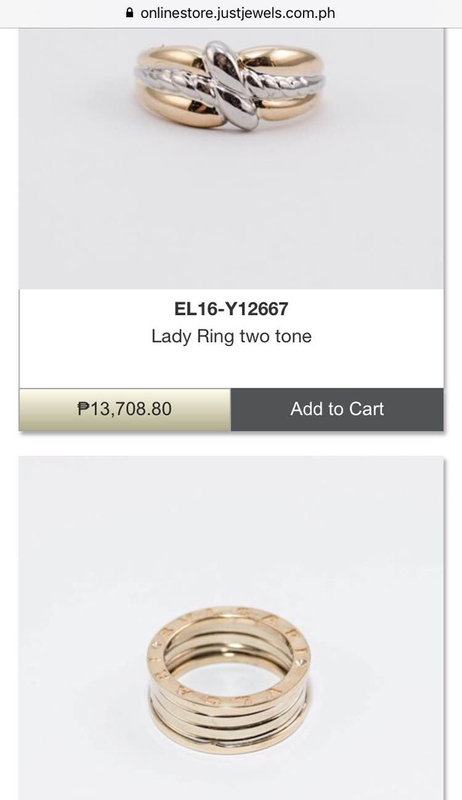 The maximum amount of an item that can be availed through the Jewelry Installment Plan is Php10,000. 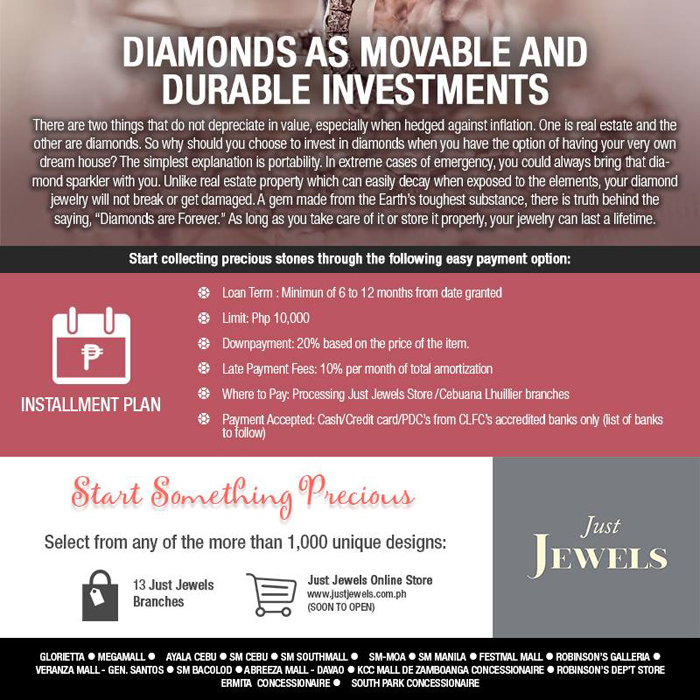 ***Payments can be made through cash, credit card, or PDC’s from Cebuana Lhuillier Financial Corp. (CLFC) accredited banks, and can be paid to any processing Just Jewels Store or any Cebuana Lhuillier branches. 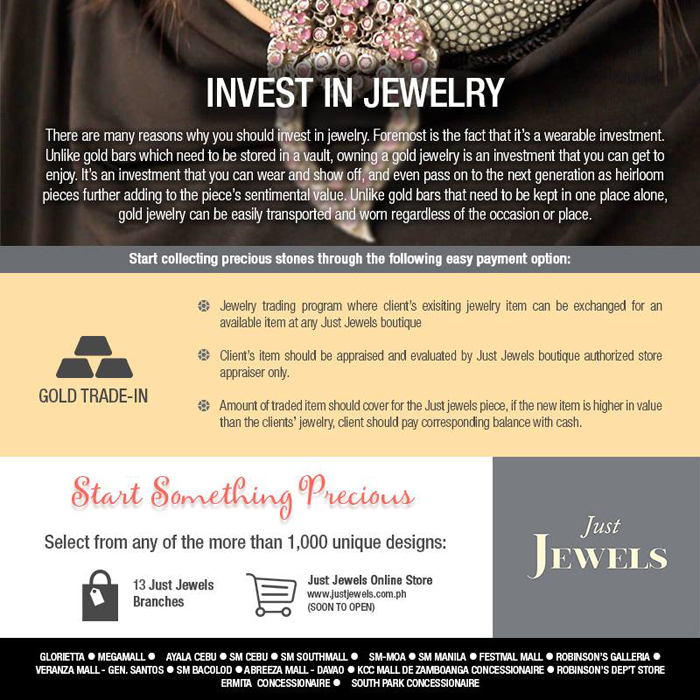 Gold Trade-in is a Just Jewels program that allows the exchange of the client’s gold jewelry pieces with other gold jewelry items in the Just Jewels store. The client’s item will be appraised and evaluated by the Just Jewels boutique authorized store appraiser. If the chosen Just Jewels item is higher in value than the client’s jewelry, clients will have to pay the corresponding balance in cash. The Alajera Network is a Just Jewels program offered to clients who want to start a small jewelry business. 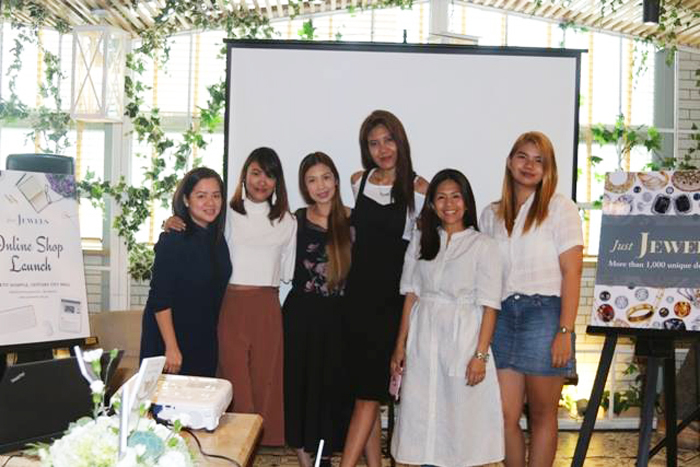 To be a Just Jewels Alajera partner, interested individuals only need to visit any Just Jewels outlets, submit the required documents and register, attend the free orientation, and get the sales kit. An authorized Just Jewels Alajera partner may enjoy up to 25% discount for any Just Jewels item. The Just Jewels Privilege Card is the loyalty and rewards card of Just Jewels first introduced in 2009. 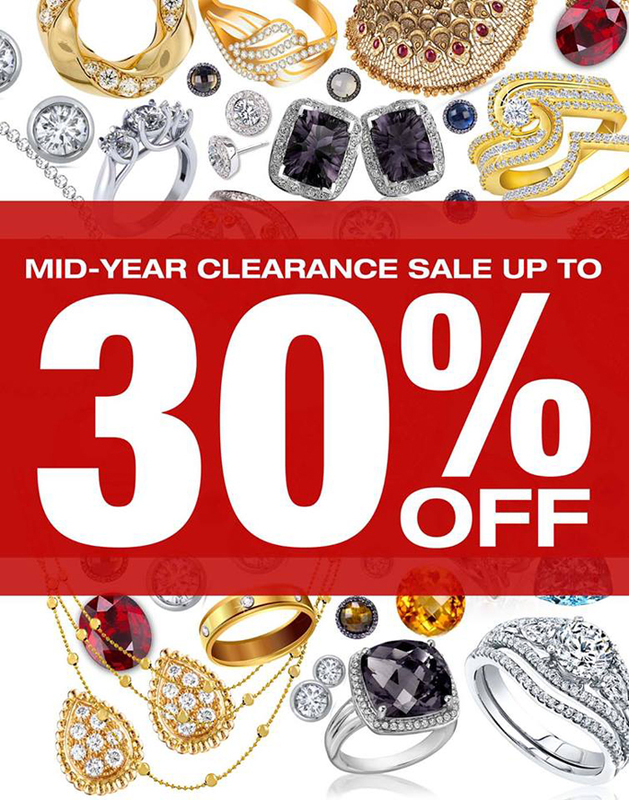 It entitles the client to a birthday discount of 20% for Php100,000 and below purchases at any Just Jewels branch. The client may avail of the discount seven (7) days before or after his/her birthday. Clients may also earn one (1) point for every regular transaction, either cash or straight payment, including trade-in and lay-away transactions. With only two (2) Just Jewels Privilege Card points, clients may already get 20% discount on their third purchased item. 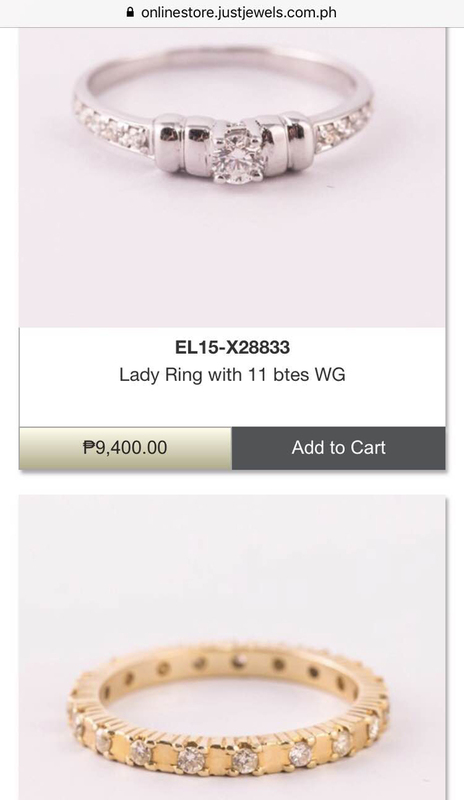 Clients may avail of the card by accumulating P50,000 worth of purchases from Just Jewels in a span of one (1) year. Me and my ring are forever. Hihi. They are on sale until July 31!!! Don't miss it! So go buy that investment piece you've been eyeing on. You deserve it! :) After all, each piece tells a story and it's a nice way to keep memories alive. :) Happy shopping! Just Jewels also has concessionaires/kiosks in the following locations. Love the ring that you got momsh!!! Super mura nya!! !